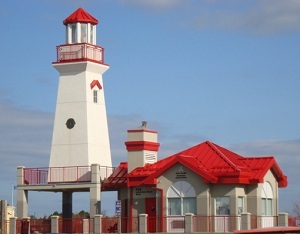 On March 7, 2012, Council approved an extension to the Cultural Node pilot project (click for updated description on pp12-31) for Port Credit, from April 15 to October 15, 2012 (i.e. during our busy summer period of events and festivals). 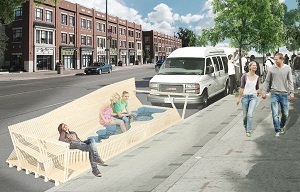 The existing pilot project includes permitting of street furniture and retail displays on the mainstreet sidewalks, relief from parking enforcement on Elmwood Avenue North during the hours of Port Credit’s Farmers Market from June to October, and more bicycle racks along the mainstreet and in our parks. The extension includes the implementation of the new Parking Space Transformation Program and the Outdoor Table Service Program. 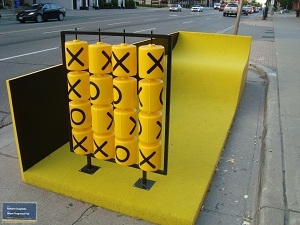 ► Click image for the City's Call for Proposals re: PARK(ing) Day in PC. ► PARK(ing) Day WEBSITE: September 21, 2012: transforming metered parking spots into temporary public parks. 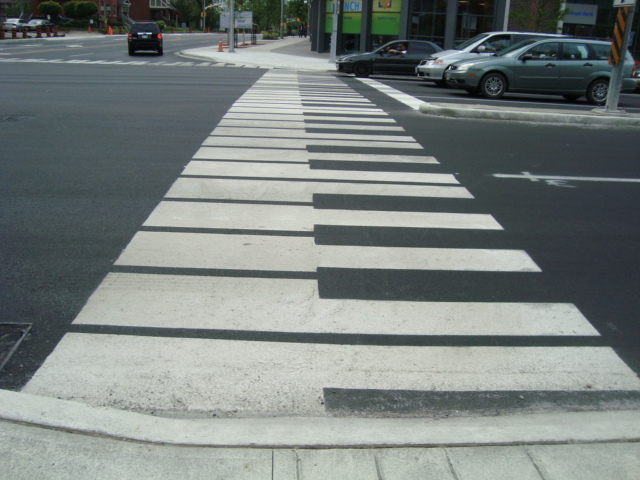 PIANO KEYS AT PORT CREDIT INTERSECTION: May 24, 2012. 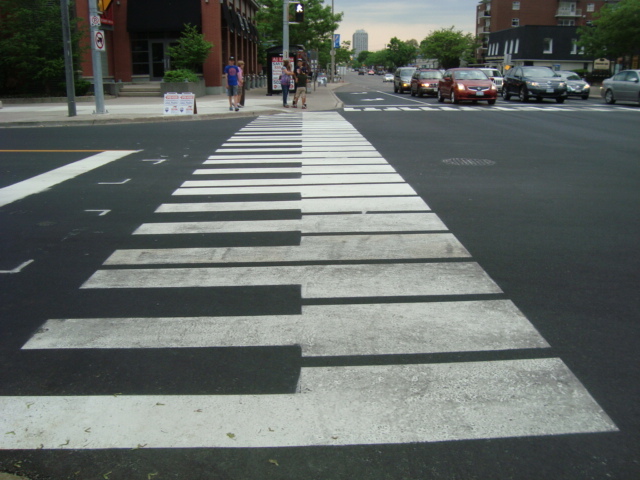 Ward 1 Councillor Jim Tovey's idea to pay tribute to Port Credit's musical heritage has now been realized at the newly-painted cross-walks at Lakeshore Road East and Highway #10 (Hurontario Street). Click for MAP. ► Click image (photo taken by Tim Rowan ) to view Facebook Page posting. ► Click images (below) for enlargement. 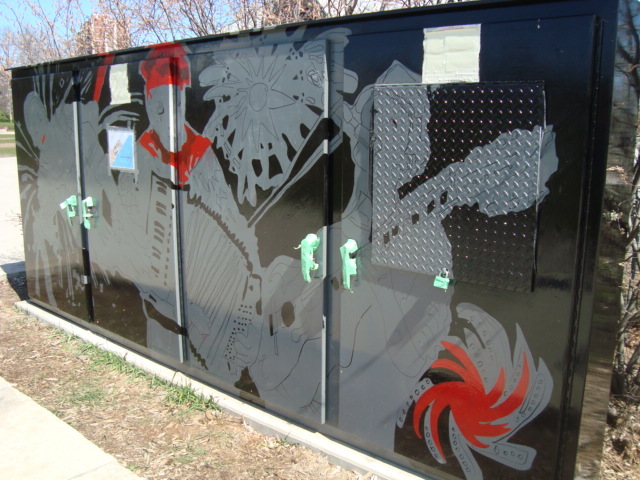 PUBLIC ART AT PORT CREDIT MEMORIAL PARK: The utility boxes at Port Credit Memorial Park (map), which have been plagued by graffiti, are starting to sport new music-themed murals. At left: Work in progress (April 8, 2012). Click for enlargement. TOPCA PAINTED BIKE PROJECT: A painting blitz is continuing in May to brighten up the bicycle planters located throughout Port Credit. Sponsored by Town of Port Credit Association (TOPCA). ► Click image for TOPCA Projects webpage. 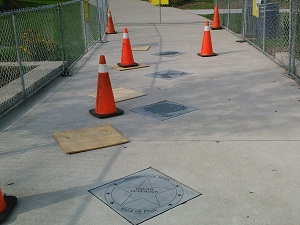 PUBLIC ART INSTALLED: Harold E. Kennedy Park (formerly Lions' Park), 20 Rosewood Avenue (map). Familia is comprised of nine sculptures in limestone and granite created by artist Stephen Cruise. According to the artist, the sculptures respond to the significant natural and industrial history of the location. The nine elements of the artwork include the following: a shell, tree, fish, fox, rail, boat, tank, lion and hive. A splendid example of public consultation being faithfully realized! 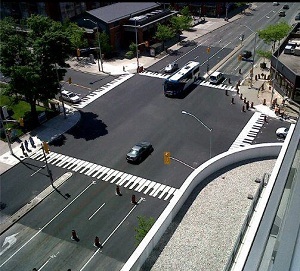 ► City's Press Release (November 10, 2011): Public Art Additions. 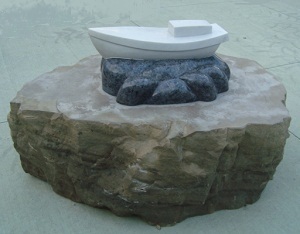 ► Click image (Boat) for WALKABOUT of the Park and the Familia sculptures (30p PDF). Adjust the Zoom in your PDF viewer for clearest images. "Lakeshore Road is the only east-west road that crosses the Credit River south of the QEW. Therefore, we need to find creative ways to further stimulate the vibrant main street area while still recognizing that the road is a significant transportation corridor. The seasonal sidewalk patios and temporary artwork, that are part of the City of Mississauga’s Culture Node Pilot Project, point to one way to achieve this aim." ► See the City's full-size Park(ing) Days BROCHURE (5p PDF) which describes all the 2012 cultural node projects. ► Click for TOPCA article about the Port Credit cultural node initiatives. 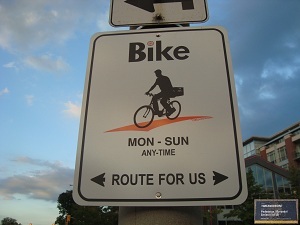 PORT CREDIT CYCLING / WALKING ART SIGN INSTALLATIONS: September 20-30 along Lakeshore Road East from Stavebank Road to Elmwood Avenue (close to Port Credit GO Station). Port Credit residents posed for the silhouettes. ► See the 10p PHOTO ALBUM on the TOPCA Facebook Page. 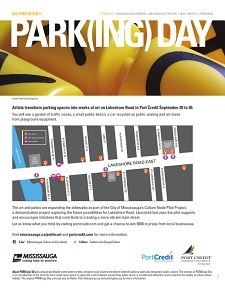 PORT CREDIT PARKING SPACE ART INSTALLATIONS: September 20-30 along Lakeshore Road East from Stavebank Road to Elmwood Avenue (close to Port Credit GO Station). Installation art is found in regular parking spots. ► See the 23p PHOTO ALBUM on the TOPCA Facebook Page. ► Mississauga News article (Sept. 20, 2012): Is that a parking spot? PORT CREDIT BOARDWALKS IN PARKING SPACES: The mainstreet boardwalks are complete and decorated with plantings, and the restaurants are serving customers on their sidewalk patios, as part of the Port Credit Cultural Node pilot project. 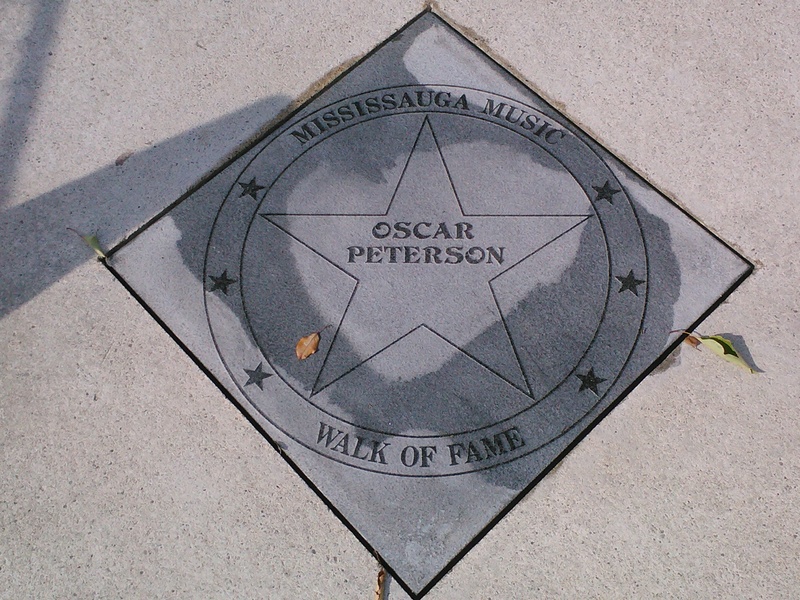 MISSISSAUGA MUSIC WALK OF FAME: On September 7, 2012 the first four inductees were honoured with a star on the new Music Walk of Fame in PORT CREDIT MEMORIAL PARK (map) on the path behind the Port Credit Library. 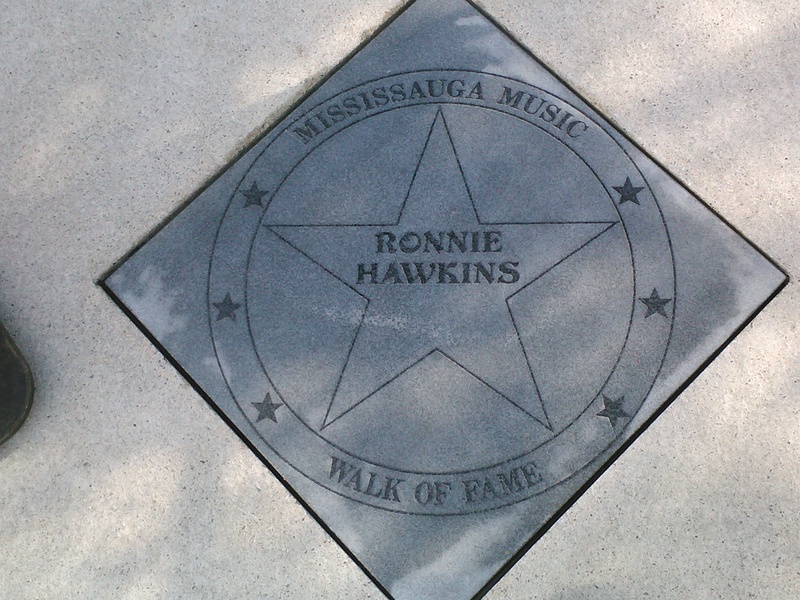 ► Mississauga News article (August 16, 2012): Four inducted to Music Walk of Fame. 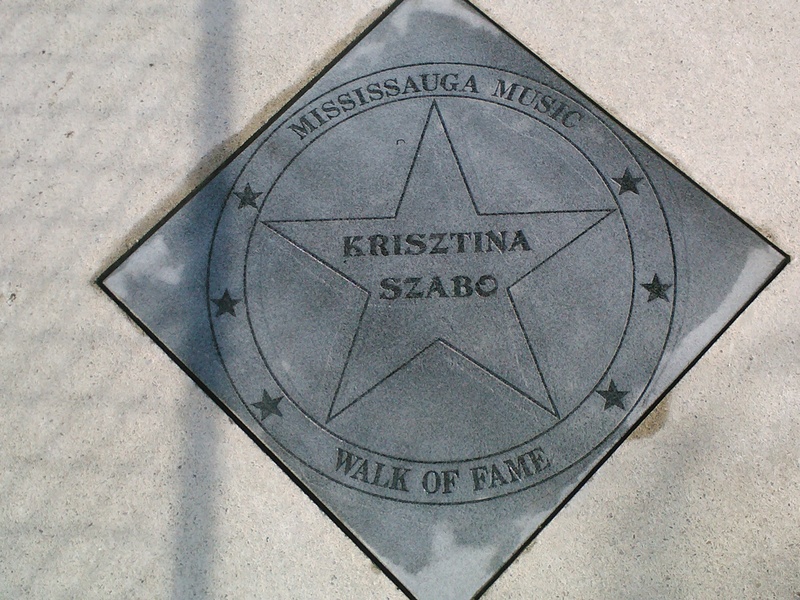 Excerpt: "Musical luminaries Oscar Peterson, Gil Moore, Ronnie Hawkins and Krisztina Szabo will be enshrined at a ceremony on Sept. 7 during the start of the Southside Shuffle...."
► Mississauga News editorial (August 16, 2012): Music makes us great. 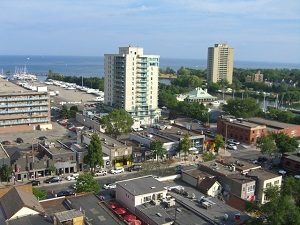 PORT CREDIT AERIAL VIEWS: Now on TOPCA's Facebook Page. Thanks to Lydia Ordonez-Niles for providing these balcony shots of Port Credit showing several landmarks about to undergo significant changes as our waterfront urban village evolves! 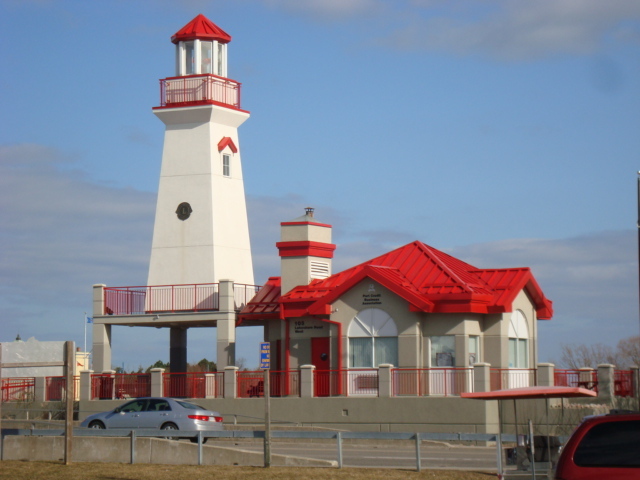 ► Like us on Facebook and get our news feed about Port Credit as it happens! PARKING SPACE ART -- GET IN THERE! 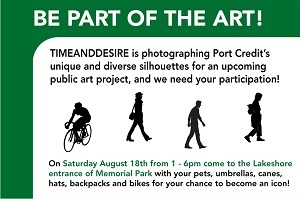 Be part of the Port Credit Parking Spaces art project (if your silhouette is used) on Saturday, August 18 between 1 and 6 p.m. at PORT CREDIT MEMORIAL PARK (map). ► Click images for full-size POSTER and renderings. TOPCA is sponsoring a chalk-drawing project on October 1-2 @ 10am - 8pm in celebration of Mississauga's Culture Days, and to draw attention to and show support for bringing more public art into the Port Credit realm. In the spirit of the project, TOPCA has already rendered its wordmark in chalk colours! 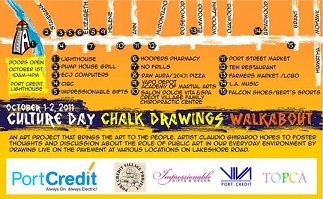 ► Claudio Ghirardo: Chalk drawings on the pavement (click for project description) along Lakeshore Rd. E. from Stavebank Rd. to Hiawatha Pkwy. Click image for full-size art card. NEW PEDESTRIAN TUNNEL OPEN: The new pedestrian/cycling tunnel under the CNR tracks was opened December 2010. According to Joanne Foote, Parks Programming, the tunnel mural was painted by artist Daniel Seagrave (Wikipedia). From a practical Parks Watch standpoint the mural should act as a deterrent to graffiti and provide a welcoming environment for trail users. The mural was painted from actual photos of the old Port Credit / Clarkson stations and rail lines. ► Mississauga News (Dec. 23, 2010): Mural completes tunnel (includes photo). Currently the city marks dead trees for removal and always attempts to replace the trees. In some cases, the trees are not replaced and tree stump transformations can create a positive impact on the community in these situations. The City has a pilot tree sculpture program. One of the trees involved is in front of the Port Credit Library at the entrance to the business district in full view of Lakeshore Road and near the famous mouth of the Credit River where salmon once flourished. Port Credit's ash tree stem will be transformed into a "salmon" spawning upstream. This information was provided by Joanne Foote, Parks Program Coordinator, Community Services – Parks. For more information phone Joanne at 905-615-3200 x 5346 or e-mail: joanne.foote@mississauga. PC175 VIDEO: Commissioned by the Port Credit 175th Anniversary Committee, Gabriella Bank of Sanborg Productions has prepared a commemorative video which reviews the entire PC175 year (2010). Now immortalized on YouTube are over thirty (30!) celebratory events which took place thanks to all the local team leaders (including TOPCA) who organized them. Hundreds of volunteers enabled thousands of participants. From Skating to Cycling to Walking, from Music to Public Art, from Fishing to Photography, from Parades to Heritage, from Gardens to Theatre, it's all there, set to the top songs in the PC175 Theme Song Contest (CD available for $5). The video is divided into: Part 1 (11:52); Part 2 (7:48); Part 3 (7:15). This video compilation was first aired at the PC175 Volunteer Appreciation event on January 17, 2011, as a way of bringing everyone's contribution together. The City has conducted its first-ever Arts and Culture Master Plan Review (ACMPR), in order to identify a sustainable, long-term vision and five-year plan to guide strategic planning, action and investment in arts, culture and heritage. Click here for more information on the City's website. TOPCA collaborated with other member groups of VIVA Port Credit to provide input to the Review. This was originally submitted in Jan. 2009 and has now been revised. 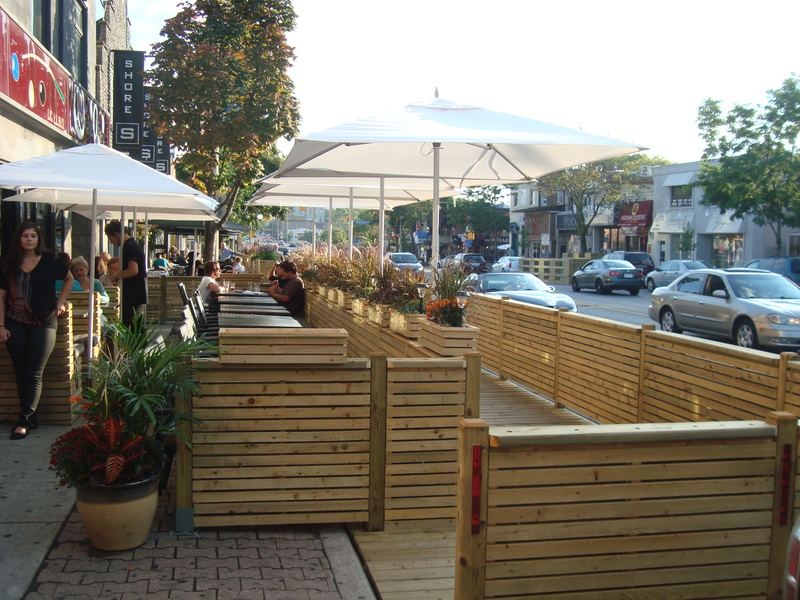 Click here to view VIVA PC's submission on Public Culture in Port Credit (includes pictures; takes a minute to download). The City's complete Draft Master Plan is now posted (click to view). TOPCA collaborated with Heritage Mississauga and the Port Credit Village Project to write and submit a Joint Response to the City's Draft Master Plan on April 30, 2009. This response contains specific comments on the Master Plan's 44 recommendations including funding, administration and cultural initiatives in Port Credit and elsewhere in the City. On June 3, 2009 the Corporate Report on public response to the Arts and Culture Master Plan was presented to the General Committee of Council along with the revised Culture Master Plan, as it will now be called. Click here for other supporting documents, including public feedback and an Executive Summary. 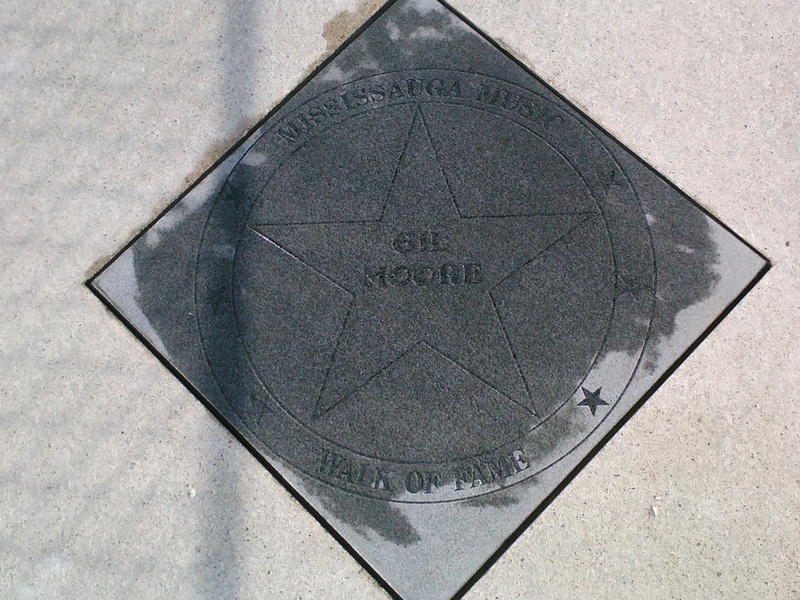 The Culture Master Plan was approved by Council on June 10, 2009. Click here for the City's press release. 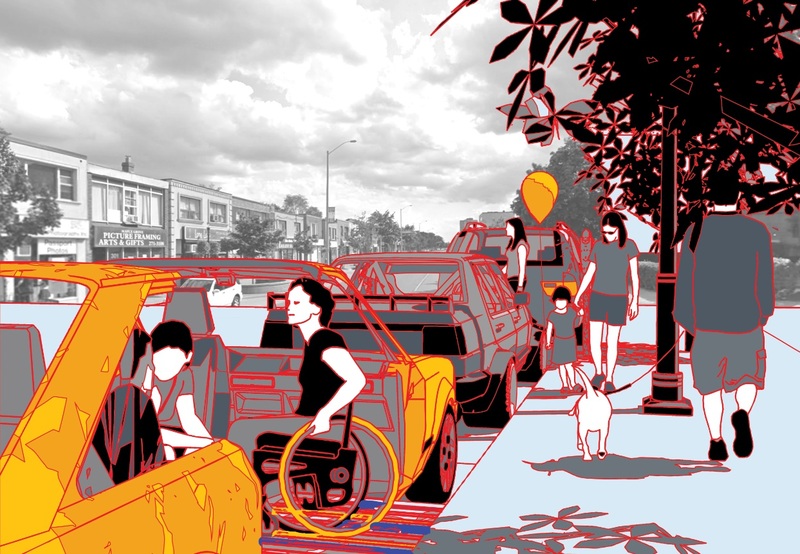 TThis local art exhibition / installation aimed to re-imagine Port Credit by engaging with the issues and concerns of the Port Credit community through the lens of contemporary art. The 8 selected artists provided a perspective on the socio-economic engines of an area undergoing rapid transformations. They addressed issues familiar to Port Credit in the form of hypothetical projects, installations and performative interventions scattered throughout the former offices of an architectural firm (Adamson Associates) at 55 Port Street East (click for map) by the entrance to St. Lawrence Park. The contemporary artists offered unconventional entry points into a series of issues which are part of everyday life in Port Credit (e.g. swans). CALL FOR ARTISTS: The Blackwood Gallery presented a second edition of The Projects: Port Credit in July 2010. 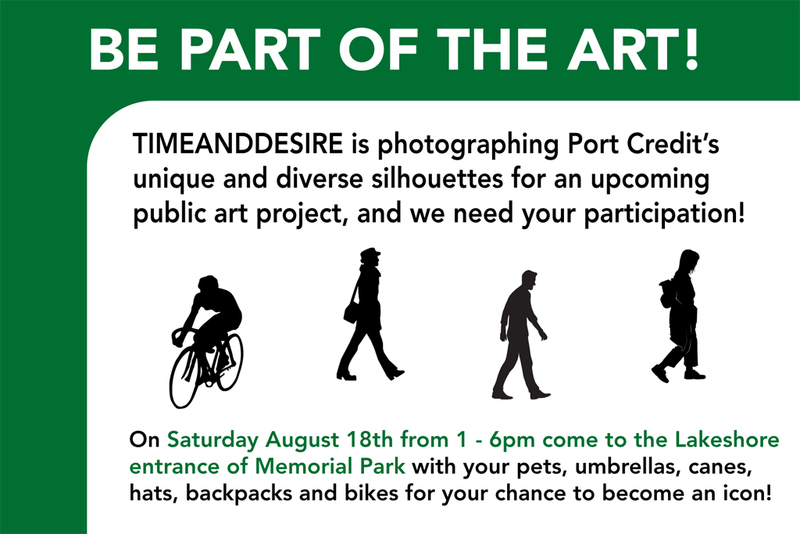 There was a call for artists based in Port Credit. Click here to view the Notice. The City has commissioned historical murals under the Lakeshore Road Bridge at the Credit River to discourage graffiti in the harbour area, especially at the base of the Lighthouse. The themes are the historical salmon fishery, and John Miller, the original Lighthouse keeper. A juried competition was held to select an artist to create the murals in August 2008. 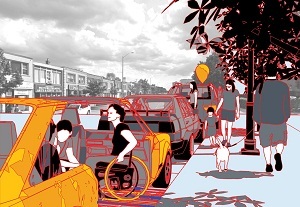 Click here to view the Call for Interest issued by the City for the Mural Competition. TOPCA, as a member group of VIVA Port Credit, was involved in the selection of the mural themes and the evaluation of the submissions. All the member groups of VIVA Port Credit supported the proposal submitted by Walter Ruston and Elva Hook, and the painting was done in September 2008. Click here to read the article in the Mississauga News: "Artists brighten up dark, graffiti covered bridge". Click here for pictures. Note that an original concept sketch is included. ► Mississauga News article (March 12, 2012): Culture project extended in Port Credit.